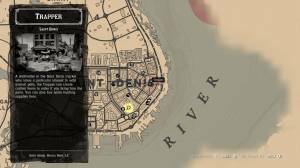 There are three trapper locations that you can visit. 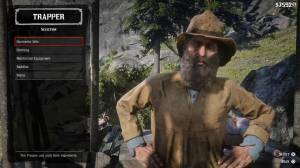 Trapper shops share the same inventory (and possibly run by the same person) so even if you sold perfect pelts to one trapper, it will be automatically considered as sold to the other trappers as well. 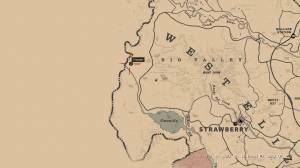 Located in the hillside north of Owanjila Pond and northwest of Strawberry, this trapper is kind of hard to reach early in the game. However, the surrounding areas are full of different wildlife, making it ideal for hunting perfect pelts. 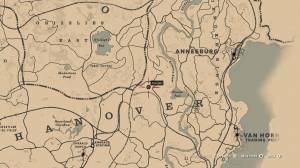 Not to mention that you can find occasional O’Driscoll camps in the area - a good source of looted items and free supplies. 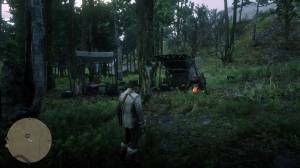 This trapper location is open 24/7 and has a campfire where you can cook your meat. Located in the forest west of the Elysian Pool and Kamassa River, this trapper is a good refuge to rest, especially if you don’t want to camp in Murfree Brood territory. This trapper location is also open 24/7. 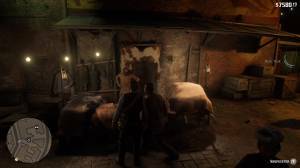 The trapper in this city marketplace follows normal shop hours. 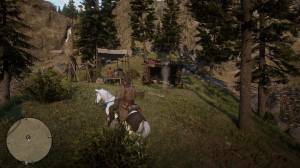 It is also conveniently located near a Fencer, making it an ideal location to sell Legendary Animal carcasses so you can easily buy the outfits or trinkets if you have the enough materials. Comments for Where can I find trappers?